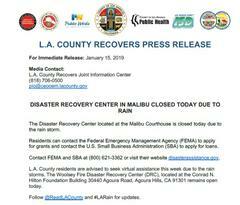 The Disaster Recovery Center located at the Malibu Courthouse is closed today due to the rain storm. Residents can contact the Federal Emergency Management Agency (FEMA) to apply for grants and contact the U.S. Small Business Administration (SBA) to apply for loans. Contact FEMA and SBA at (800) 621-3362 or visit their website disasterassistance.gov. L.A. County residents are advised to seek virtual assistance this week due to the rain storms. The Woolsey Fire Disaster Recovery Center (DRC), located at the Conrad N. Hilton Foundation Building 30440 Agoura Road, Agoura Hills, CA 91301 remains open today. 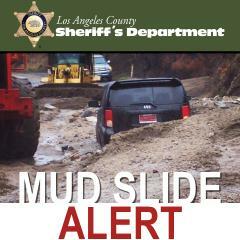 Follow @ReadLACounty and #LARain for updates.